Scartol: is the move for Black, threatening the snapback throw-in at a. White can't threaten the double-capture at b, because Black will immediately take and have the extra room to make the snapback happen. Black emerges with a victorious grin. Fhayashi: is futile, right? Isn't it better played elsewhere? kishi Can white recover this corner in any way? Or save itself? unkx80: The short answer is, no. abcd_z: The solution I can up with had a slightly larger snapback, but it amounted to the same thing. 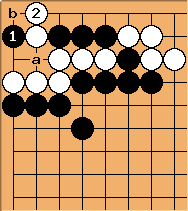 White is dead, and an attempt at a would lead to a snapback at b. The variation at the last diagram does not work. 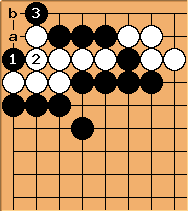 White captures and wins the semeai by the virtue of an eye against no eye. 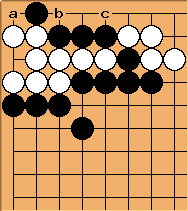 If Black a then white captures with b, if Black b then white plays c and yet black is short of liberties. White has all the time in the world to capture.